A New History of Christianity in China, written by one of the world's the leading writers on Christianity in China, looks at Christianity's long history in China, its extraordinarily rapid rise in the last half of the 20th century, and charts its future direction. Contextualizes the growth of Christianity in China within national and local politics. Contrasts China with other non-Western societies where Christianity is surging. What made the experience of listening to A New History of Christianity in China the most enjoyable? Daniel Bays did a great job in providing a continuous narrative to the story of the Christian church in China. I did not realize the different streams had affected China at various points in history, and it is interesting to note how big a part the Christian church played in China at times, and then how it seemed to be snuffed out at others. What other book might you compare A New History of Christianity in China to and why? I have not read such a comprehensive book on this specific topic, and I suppose I am not enough of a history buff to say I look for this kind of narrative in other cultures. What about Christine Marshall’s performance did you like? Although her English was expressive and easy to follow, her Chinese names and proper nouns were truly horrible. Even common Chinese places and names were made so unrecognizable when she pronounced them, it was really unbearable. I have had this experience with many English-read Chinese audiobooks, and you really should get someone who knows Chinese and at least do a voiceover for the Chinese words. I had to get the written copy as well, because there was no way I could get all the facts and names from hearing her read. Not to be read in one sitting unless you are already a master at this topic. For me it was a lot of new information that I wanted to digest slowly. Great job by the author. I enjoyed this interesting explanation of Christianity in China to be most interesting. I had little knowledge of China or its history prior to listening, the author did a wonderful job in telling this amazing story. The reading is enjoyable. I liked this a lot. I learned a lot! 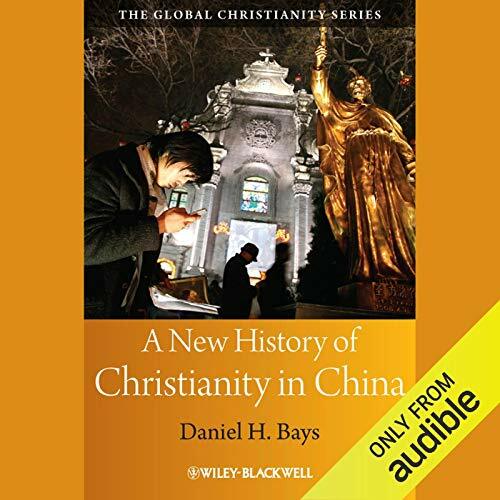 This book is very informative as its title indicates about the history of Christianity in China and the information is quite updated, but the book contains little information about Christian faith itself. Bays is a solid scholar in this field, and he has clearly made an effort to present the nuances of this topic in a way that even listeners who don't know specialist terminology or even basic Chinese history can follow his points. Considering that this is a history book, the narrator does a decent job of avoiding monotony. I very much appreciate that she took the time to learn how the q's and x's in Chinese words are supposed to sound. Oddly she didn't bother with the consonants, so that most of the time she says "Tang" like she's ordering orange drink in Cincinnati. I also wince every time she pronounces "bas-relief" as "bass-relief"--the word comes up several times--but this is minor. What did you like best about A New History of Christianity in China? What did you like least? Terribly narrated! Sounds like a computer generated voice and the Chinese place names were so badly pronounced that I wasn't at all sure where she was talking about much of the time.